John Crowley, twenty-five years old and a freshly minted diplomat, had been delighted to receive orders to a small African consulate staffed by four Americans (he would be one of them) and six or seven African employees. Struck by what seemed the lyric beauty of Paton’s Cry the Beloved Country and inspired by the election of President Kennedy two years before, Crowley had volunteered for the assignment. He aimed to make his mark with this first posting in Congo du Nord, which had become independent in the first wave of decolonization then taking place. But as he prepared to leave Washington Crowley’s enthusiasm became increasingly laced with trepidation. The reports he pored over characterized living conditions at the consulate as somewhat difficult. The fact he’d be required to ship ahead a six months supply of basic foodstuffs lent disturbing credence to the description. And so did tales told by “old Africa hands” at the State Department, tales studded with references to throat-clutching wet heat, endemic cholera and malaria, biting animals, biting snakes, biting insects, and hostile human inhabitants. Press accounts of recent political uprisings particularly gave him pause. Along with murdering local officials and tribal rivals, dissident soldiers had tortured and killed a dozen European and American missionaries, traders, and oil workers. Yes, somewhat difficult. Crowley traveled the last leg of his journey to post aboard a wood burning, smoke spewing river steamer that churned along a Congo tributary at a maddeningly slow pace. Deposited in front of the consulate by a driver who’d retrieved him from the boat landing, Vice Consul Crowley hefted the pith helmet he’d purchased in Paris and blotted away the grime and sweat from his head with a sodden handkerchief. No report, no story, no press account had braced him for the enervating hotness. Engulfed by disappointment, depression and fatigue, why, he wondered, had he ever come here? Idealism, it seemed, had been rendered a fragile and fleeting thing. A young man of medium height, slim and clean-cut, but tentative looking, Crowley would not likely have stood out in a crowd, even a small crowd. Appearing more youthful than his twenty-five years, he had light hair, cut short, and dark brown eyes set in a soft-featured face, one now flushed by overlong exposure to the sun glistening off the river. He appeared perplexed and worried; a not surprising reaction to his first glimpse of the place he expected to work and live for the next year. He realized how awkward he must look in his now soot-speckled white linen suit, an outfit a Washington haberdasher had convinced him was absolutely de rigueur for a tropical post. The American Consul, Paul Wimberley, came down the consulate steps to greet him. A time-server awaiting retirement, Wimberley was a tall, faded man whose career had foundered on alcoholic shoals. Once competent and ambitious, but now leached out and simply finishing his final assignment, Wimberly, a gray haired man with gray eyes and a gray personality, hardly defined the sort of leader you could count on in a crisis. His first words, “Welcome to Fort Apache, Mr. Crowley,” failed to reassure. 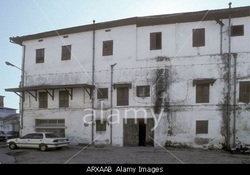 Occupying a one-time French mission station, the derelict-looking consulate was situated six or seven kilometers from the river and just off a narrow black topped road that led to the national capital seventy-five miles away. Located not far from a district headquarters town, it looked like a place even the hardiest veteran of African shores would disdain. With its faded and shabby wood exteriors, like Wimberley’s salutation, it bred little confidence in Vice Consul John Crowley. Unlike Fort Apache, it didn’t so much as have a wall, and even the tattered American flag suspended from the verandah looked tired. Once inside, Crowley recalled a production he’d seen of Somerset Maugham’s “Rain.” Except the rattan furniture on the stage had looked to be in better shape than what he now encountered. “The electricity comes and goes,” Wimberley said blithely as he ushered Crowley through the main building’s interior. Crowley mentally inventoried rough wooden floors, a few worn chairs, an old sofa, four battered desks, rusting filing cabinets, and an iron safe. Newly acquired but little used Selectric typewriters perched like showpieces on desktops. Crowley had envisaged something different, perhaps even exotic, but not this. Disillusion clouded his eyes; the place could only be described as a dump. John Crowley’s morale bottomed quickly. “Oh, I see,” Crowley said. But he really didn’t see. Rampages? There had been no allusion to rampages and no mention of whacking in the reports he read. Wasn’t that all in some other part of the country? Crowley supposed he looked nervous. Hop in the van? That was the plan? Once again Wimberley’s words failed to reassure him; like the flag, Crowley’s spirits sagged. He reckoned the assignment would be much harder than he had imagined. And meeting the rest of the American staff kindled his spirits barely a whit. Vice Consul Alec Crigler was a hollow-cheeked, gaunt-faced young man with ash-blond hair. He had slender, sensitive hands. Crigler impressed Crowley as a nice enough and bright enough person, but he came across as shy and self effacing. Accordingly, he seemed inclined to agree with whatever opinion he’d last heard. “It’s not so bad here once you get used to it, and we get to make courier runs to the embassy every two weeks,” he said. The American secretary, Marsha Ryerson, her hair imperfectly restored to blond with color from a box, was a woman in her early fifties and, like Wimberley, only months from retirement. She wore slacks and a short sleeved blouse. Too many assignments in the tropics had hardened and lined her face, probably never pretty to begin with. But her appearance notwithstanding, during those first days Crowley found her to be helpful and tolerant of his mistakes, notably in his sputtering efforts to master the rarely used code book and the radio. Soon after they met, she cast a near-maternal eye on him and said, “Mr. Crowley, you seem to be a nice young man. But I’m not sure you’re ready for this place.” Her words embarrassed him, but he suspected she had it right. He liked her and hoped to learn as much from her as he could before she left. The State Department had officially designated the consulate an extreme hardship post, and limited the tour of duty to one year; no families permitted. Staff members all lived in a cluster of wooden buildings, the two vice consuls (for the moment, three) in one small bungalow and Ryerson in another. The Consul resided in the main building, and they all took their meals there, served by a local cook. There were two outhouses -- one for the Americans; the other for the African staff. Crowley considered the arrangement at odds with efforts to end segregation back in the States. Somehow, whichever facility he used seemed a wrong choice. Mostly they were there, Wimberley declared, to show the flag and demonstrate US support for the fledgling government. The consulate, he guessed, would probably only last a year or two. In the meantime, mining and oil enterprises engaged the country’s newly independent government in deal-making and American company representatives, workers, and traders, came and went. Along with issuing occasional visas, the staff provided notarial services, renewed or replaced passports, and listened empathetically to accounts of harsh treatment inflicted by local officials and rogue gangs. In addition, staff members fielded a litany of missionary concerns and complaints. Ostensibly Wimberley and his junior colleagues also kept their fingers on the regional political pulse, but, in fact, their fragmented knowledge, funneled to them through a Congolese political advisor proved superficial at best. Crowley had been at post exactly three days when a new round of rebel activity erupted. Confused by what he heard, he did not know what it might imply for the consulate. He had no idea of who was fighting whom. Wimberley tried to explain the politics to him. His exposition left Crowley lost in welter of names, acronyms and other references. And when the boss finished, as best Crowley could work it out, there really weren’t any good guys. The distant grumble of gunfire gave him the jitters. Even the veteran staff members seemed nervous; an ailment the young vice consul found disturbingly contagious. What an unpromising start to his African adventure. Crowley had yet to learn how to pronounce the names of the consulate’s African employees, and he had barely settled into his office routine when government broadcasts warned that rebel forces had once again launched a march toward the capital. The consulate lay directly in their path. Nonetheless, Wimberley shrugged off the reports as insignificant. This sort of thing had happened before, he said, and the dissidents never got very far. Crowley had slept fitfully and awoke suddenly in the early morning, the seventh since he’d arrived. He extracted himself from beneath the mosquito netting that sagged over his cot, retrieved a pencil from a side table, and, one by one, lined out seven days on the patent medicine-promoting wall calendar he’d inherited. Fifty-one weeks to go. His notion of the diplomatic life had soured. Homesick, disappointed, and frightened, Crowley lingered on the edge of his simple bed and wished he was back in Maryland. The only sound was that of the soft, regular breathing of his consular colleagues asleep on their cots in an adjacent room. Unable to sleep himself, Crowley slipped on a shirt, trousers and a pair of low topped boots and went outside to relieve himself. Nothing moved; the air hung still and oppressive. All was silent, save for an incessant olio of insect voices and the distant screams of monkeys. Wet greenness, lush vegetation, and matted growth engulfed and choked the world in which he found himself. Moisture embraced every leaf, dripped from every plant. It was a world for which Crowley felt ill-prepared, one that suffocated his spirit. Odd, he thought, neither of the security guards seemed to be on duty. Henshaw had denounced them as worthless, and Crowley inclined to believe him. He guessed they were probably asleep in the little shed behind the consulate. Like a ghostly ambience, wisps of fog floated everywhere, visibility still limited in the vapid light of breaking dawn. Crowley stood in front of his cottage, swung his arms to and fro, and then rotated his head to loosen a stiff neck. Mindful of warnings not to leave the compound, he walked tentatively toward the highway, now and then wind-milling his arms. With nothing particularly in mind, he glanced up the road to the north. That was when he saw them, spectral forms of perhaps a dozen armed men on foot. My God, he thought, they were almost there. The moment seemed eternal. He knew with unyielding certainty they had seen him just as he had seen them. To stay spelled death; he had no doubt of it. Already brittle, his nerves crackled like branches under assault in a tropical storm. Swept by a surge of terror such as he had never experienced in his twenty-five years, Crowley frantically searched his pocket. The Americans all carried keys to the van. Reason yielded to panic; obligation to self preservation. Clutching his key, Crowley sprinted to the van, and piled in. His heart wrapped around itself, he pulled up to the front of the consulate and sounded the horn, but no one came out. Nor did anyone emerge from the cottages. He shouted through the van’s open window, still no one appeared. Seconds seemed to last for minutes. Time. Where were they? Couldn’t wait. Simply no time. He tromped on the accelerator, and the tires flung up a spray of gravel and stones as he accelerated out of the compound. He could do nothing for the others, he told himself. He had no choice. Who could blame him? Awash in perspiration and fear, he hurtled away toward the safety of the capital. Then, a mile or so down the road, Crowley jammed on the brakes. What had he done? Dear God, what had he done? Still time. Maybe still time. He swept around in a quick u-turn and sped back. But, the pillar of black smoke climbing skyward from the consulate site informed him he’d arrived too late. The van’s tires squealed once more as Crowley skidded around and raced off toward the capital. The Inspector General’s report said that on the day in question, Consul Wimberley and his staff had been awakened by a honking horn and by Vice Consul Crowley’s shouted warning of the rebels’ imminent arrival. Before they could fully rouse themselves, they realized Crowley had driven away in the consulate vehicle. Those Americans, thus left behind, made heart-rending pleas for help on the radio. Then the transmissions abruptly terminated; the compound had been overrun. Crowley arrived at the Embassy two hours later, incoherent, his story confused and inconsistent. Two days later an Embassy security team accompanying government troops confirmed the remaining Americans, three men and a woman, had been slaughtered. The details had been revolting. In the course of a State Department inquiry, Crowley insisted over and over, “There was nothing more I could do. I had no choice. I went back; everyone knows I went back.” Recounting his version of what had happened, his voice seized up, and he struggled to form words. He trembled throughout his testimony. Observers deemed that testimony pathetic and not compelling. But no African staff members had been present and no witness could be found to refute Crowley’s account. Moreover, no clear-cut ground could be found to warrant disciplinary action. Cowardice in the face of an enemy, a military crime, did not seem to apply to a diplomat. In the end, after much legal to and fro, the government simply allowed Crowley to resign (albeit under a heavy cloud). The near-universal conclusion in the diplomatic community was that his story did not ring true; he could have done more. John Crowley’s diplomatic career crashed before it began, and the Maryland girl he’d hoped to marry sent him a curt note bidding him farewell. For his part, Crowley clung to the belief that he was a good person; that a moment of human weakness had caused him to fall from grace. It could happen to anyone. Yet, despite his efforts at self-justification, in his gut Crowley despised himself for what he had done. Over time he found comfort in the notion that bad choices were not irredeemably etched into your life; they could be overcome. While the chapter could not be rewritten, perhaps it could somehow be offset, compensated for. He desperately wanted to regain his lost moral identity. Nonetheless, he became a marked man. The story of that horrific morning, with endless embellishments, continued to circulate throughout diplomatic and expatriate communities; wherever a drink was quaffed and a tale told, John Crowley became the subject of ridicule and condemnation. Yes, they would say, he got off too lightly. As years passed, they added a question to their palaver: whatever happened to him? Yes, whatever happened to John Crowley? More than ten years had passed when, in 1975, Crowley parked a Range Rover in front of a broken-down jungle hotel. He climbed out, tugged his ball cap visor low in an effort to fend off the pounding sun, and squinted up at the aslant hand lettered sign over the entrance. Hotel Palais, it said. God, what a joke, he thought. His face and arms tan, Crowley was still slim, but tougher now, wirier. At least outwardly, over the years he’d become more assured in his manner. He wore jeans and a gray tee inscribed front and back with the slogan: Helping Others Help Themselves. He winced as a miasma of rotting vegetation assaulted his nostrils. Crowley crossed the lobby and strode into the dank barroom. Hoisting himself onto a stool, he said, “You got anything cold?” A ridiculous question; he knew the answer. The bartender, a man of indeterminate ethnicity who sported shorts and a stained tee shirt bearing the logo of a local West African soccer team, shook his head. “Just beer today. Nothing else, mon ami.” He accompanied his words with a smile, deprecatory and largely toothless. “Then, beer it will be,” Crowley said gamely. The brown bottles lacked labels, and downing their tepid contents called for a generous dollop of faith. Who cleaned or filled the bottles or where they did so were questions you didn’t want to think too hard on. As he raised the bottle to his lips, Crowley became acutely aware of two men seated at one of the three or four tables in the place. Mining engineers from the look of them, they had their sights on him. Both were outfitted in laced boots and tropical khakis. They’d nodded knowingly to each other when he came in, and now they made no effort to moderate their voices; indeed, they likely intended he hear what they were saying. “He’s the one; I’m willing to bet on it,” one of the men said. A thickset, rough-faced fellow, he peered at Crowley through heavy lensed spectacles. From his accent, Crowley supposed him to be English. The other man, lanky and displaying a dark mustache as greasy as his thinning hair, replied, “Yeah, that’s him all right. I hear he’s one of those NGO do-gooders now. You can almost see the yellow streak.” Crowley recognized him as unmistakably an American. Crowley ignored them and moodily sipped his beer. He’d been the target of such comments before, and he knew it would not be the last time. His reputation traveled with him; if not before him. The business at the consulate happened such a long time ago. But people persisted in resurrecting it. Maybe it intrigued them. Maybe it made them feel superior. Crowley didn’t know. Crowley ignored the men, finished his beer, and decided to continue on to the refugee camp where he had worked for the last year. For the better part of a decade he’d served with various relief organizations in some of the most inhospitable places in the world. This one met that standard. The refugees who crowded into the camp constituted the detritus of the endemic civil wars that spanned the region. The violence of those wars wreaked havoc on the innocent. Miserably poor, chronically ill, and incessantly hungry; the refugees were looked down on by their former colonial masters and by other Africans, especially those with guns. Grim as the inhabitants’ circumstances might be in the camp, they were far better than those they had faced before making the trek there. Often as not, the refugees had survived massacres, atrocities, and genocide. Death outside the camp came easily and often, lost lives little remarked; indeed, life seemed to have lost all human significance. Crowley unstintingly sought to help these people survive and, beyond that, he hoped, to give their lives significance, a sense of worth. A guard swung open the gate to the camp’s central compound, and Crowley drove through. The compound occupied an area of perhaps two acres enclosed within a chain link fence topped by razor wire. Crowley rolled past the cinderblock warehouse where food stores and other goods were kept and killed the motor in front of the low lying administrative building. It was here he and other officials had their offices and living quarters. Blue lettered white signs identified this building and the adjacent medical clinic. A sprawling collection of tents and plastic sheeted shelters was situated to the south of the agency compound, all of it overseen by a Norwegian director. Immersed in persistent smoky haze, the camp contained about 1,500 men women and children, many of them from the neighboring republic of Free Congo. The multinational foreign medical staff consisted of four doctors and four nurses. They, in turn, were assisted by a team of Congolese nurses and orderlies. Sanitation posed a constant problem, and at times the Indian medical director simply threw up his hands. Despite generous doses of disinfectants the latrines emitted overpowering odors. Newly arriving staff members were warned that you’ll smell it before you see it. Crowley’s assignment involved the delivery and distribution of food. It was simple fare—farina, beans, pumpkins, rice, Ovaltine, and the like--and the refugees prepared and cooked most of the food themselves. Crowley also oversaw the delivery of trucked-in water and coordinated with the medical staff on water purification. Two young Canadian men, a team of African warehousemen and drivers, and fifteen Congolese and Burundian food handlers assisted him. Crowley’s crew worked round the clock to transport, store, and distribute food, a grueling, never-ending task carried out under extraordinarily difficult conditions. Crowley struggled to sustain the workers’ collective spirits through encouraging words, fair treatment, and consideration for staff and refugees alike. No one questioned his personal dedication. Crowley made the extra efforts and set the standard for hard work. But, it remained a challenging task. “I’m back,” Crowley said through the open door when he walked by the director’s office. The place was fragrant with cigar smoke, somehow incongruous in that setting. “They’re still in the port, but they promised they’d be here in two days,” Crowley said. A bespectacled, fiftyish man, Bjornsen came across as sober, slow-moving, and generally pleasant. Crowley viewed him as a genuinely goodhearted person. Unfortunately, at times Bjornsen’s job seemed to overwhelm him. He inclined to procrastinate and, caught up with little things, he sometimes missed the big ones. A committed pacifist, Dr. Bjornsen seemed confounded by the fact that marauding gangs of former soldiers from across the border had become increasingly brazen. In the preceding month they had twice hijacked food shipments -- the convoys made tempting targets. It wasn’t only Bjornsen’s dithering management style that concerned Crowley. A stew of petty animosities and jealousies plagued the larger staff. And for many of the workers, the humanitarian ethos that once inspired them, that once lifted their spirits, had long since evaporated; now they simply performed a job, a burdensome one at that. But Crowley persevered, as if selfless dedication and hard work would in some way offset the past. Driven by inner demons of guilt and shame, Crowley sought expiation by helping others. Through self-sacrifice, a kind of self-imposed penance, he sought to redeem himself, to restore his moral selfhood. Despite his good works, however, he could not shed the reputation; for those who knew him or knew of him it seemed he would always be the one who ran. The event haunted him like an omnipresent ghost. No day passed without some recollection, some reminder. Why had he run? Cowardice seemed the unremitting answer, but could his action have been nothing more than chance impulse? Five minutes earlier or five minutes later might he have behaved differently? If only time could be snatched back. Weeks passed without further depredations. Dr. Bjornsen smiled benevolently, convinced the worst had passed and that Crowley had been unduly alarmist. Then word reached the camp that turmoil once again embroiled the neighboring capital; army units had mutinied over pay delays. Angry soldiers had abandoned their barracks to demonstrate at Government House and more ominously some had vanished into the bush, swelling the ranks of former comrades already there. Bjornsen could smile as much as he wished; Crowley worried. His worry had merit. Days later and only a few miles short of the camp mutineers ambushed a weekly convoy transporting food and a much needed medical supplies. The attackers not only stole two of the loaded trucks, they kidnapped their drivers. After pillaging a third truck that would not start, they set it afire. Most troubling, one of the drivers tried to run away, but was caught and hacked to death with a machete while, unmoved, the rebels looked on. Surviving drivers also told Crowley the hijackers interrogated them about the warehouse and about camp security. At Dr. Bjornsen’s large morning staff meeting, indecision, confusion, and fear permeated the room; clear thinking, planning, and leadership appeared to be in short supply. News of the attack had just reached the camp and the twenty or so staff members fixated on the threat. They could well be next. “Why aren’t the soldiers already here to protect us?” one of the doctors said. “What about the refugees?” someone said. “Yes, we can’t just abandon the refugees,” Crowley said. “Or our local staff. God knows what the mutineers will do to them.” Heads nodded and there were sounds of assent around the table. “Wouldn’t it perhaps be more appropriate for Mr. Pimsbury to go?” Bjornsen said. “I think, he’ll agree. He needs to be here to supervise our own guard force.” Crowley locked eyes with the security chief, who seemed un-persuaded. Not many heads bobbed in agreement. “As I said, I’ll be back in the afternoon,” Crowley said. Was Bjornsen questioning his motives for leaving the camp? Were his colleagues? “Why is only one person going while the rest are left here like sitting ducks,” the Swiss administrative officer said. As the conference room continued to buzz with discussion of how best to respond to a rebel assault, Crowley rose from the table, and strode out the door. He felt good; he had demonstrated his willingness to act decisively and in the best interests of his colleagues and the refugees. He was doing the right thing. Vaporous memories of the event a decade earlier drifted about in his mind, but they initially made no purchase as he climbed into the Range Rover and drove out the gate. The road Crowley traveled that morning was ill-maintained, and unpredictable pot-holes mandated reduced speed and a watchful eye. And, adding to his discomfort, even at that early hour, wet jungle heat poured in and saturated the interior of the vehicle which lacked functioning air-conditioning. Moreover, Crowley realized, the two-way radio was inoperable. Bjornsen had considered repairs too costly. Entries of Bjornsen’s shortcomings mounted in Crowley’s mental catalog. Especially troubling had been Bjornsen’s reluctance to take seriously the threat posed by the rebels. Show them we mean them no harm. Didn’t he grasp the fact they were killers? Killers; of course, they were killers. As Crowley pondered the reality the thought represented, he realized that Pimsbury’s argument had made sense; perhaps the foreign staff should have been evacuated. It would have been the prudent thing to do. Yet both Crowley and Bjornsen had opposed the idea, albeit for different reasons. Now Crowley confronted the realization that his argument not to evacuate the compound was little more than a show of bravado, one intended to fend off resurrection of the image of him as a coward. Surely, the staff was ill-equipped to defend itself; the majority of foreign staff members had never so much as picked up a weapon in their lives. Additionally, Pimsbury had told him privately he did not trust their own guards; he feared they would take to their heels at the first sign of real danger. As he reconciled himself to these realities, for Crowley the arrival of government soldiers took on added urgency and importance. And, thus, so did his mission. He’d covered only a few miles when he came upon the blackened wreck of the truck burned by the mutineers days before. A stark reminder of the sort of people they were up against, it gave him pause. The rebels had been there; they could be there even now, perhaps concealed in the creeping dampness of the roadside undergrowth. That prospect set in train a fluttering case of nerves. Increasingly keyed up, Crowley stayed alert for signs of rebel activity, but saw none. As he maneuvered past the charred truck, he could not help but wonder exactly where it was the poor driver had been murdered. The thought of that horrendous act unleashed yet another shiver of apprehension that rippled across his perspiration-soaked back. He took deep breaths. It didn’t help. He would soon pass the single lane road that branched off to the Expo Mining Camp. That installation had so far avoided attacks, he knew, by paying handsome sums for protection. He wondered how the miners were faring during the latest round of rebel activity. He did not have to wait long for an answer. “Out of gas. Can you give us a lift?” he said. He pleaded with his eyes. These were the people who had mocked him, Crowley thought. Had they too simply run; had they abandoned their colleagues? “There’s a jerry can in the back. Help yourself. I can’t stop.” Truth told, the prospect of dealing with a wounded man, indeed the prospect of any encumbrance, put him off. Crowley was already assailed by palpitating stress; the report of the mining camp attack ramped up his anxiety. The man reached in and retrieved the can. “Probably hit your place next,” he said. Bitter at being denied a ride, he seemed to take pleasure in saying it. Share the pain. Gunning the engine of his vehicle, Crowley sped away. In his rearview mirror he saw the American man pouring gas. He’d done enough. Thirty minutes later Crowley rolled up to the shambles that had once been a four-walled French fort. Despite its appearance, it seemed an oasis of hope. He expected to be challenged by a sentry. Instead a man lounging next to the gate simply waved him in. No one seemed to be about. The parade ground stood empty. Crowley saw no soldiers? Crowley climbed out of his vehicle and marched straight to the Military Advisor’s office. “I am here to see the Advisor,” Crowley said. She waved her hand toward the instrument. But when he tried to ring up the compound the line was still dead. The wires had probably been cut. Now what? For an instant his resolve faltered like the electricity going out of the camp generator. He’d tried hadn’t he? Yet, it had all been in vain. Crowley’s mind raced. He’d promised to bring help. But he could not. His mission had failed. Worse yet, the rebels might even now be headed for the unaware refugee camp. Then it flashed through his mind. Whatever the danger, he could not repeat the performance of a decade earlier. He could not abandon his colleagues a second time. He could not. Perhaps enough time remained to evacuate the staff; the camp motor pool had several trucks and vans. All notions of defending the place melted away, Crowley roared out of the fort and back down the road he had just traveled. He had to try. He had to rescue as many as he could. The Range Rover shuddered and pounded over the rough road. Burning sunlight caromed of the metal hood of his vehicle and nearly blinded him. Peering over the wheel, he pushed on. This time when he encountered the two mining engineers, he slowed but did not stop. Their bodies lay sprawled by the road. Their car was gone. Perhaps only God knew exactly what had happened. But Crowley knew enough. The mutineers were on the march. How could it be happening again? Reality and unreality became one. Memories of that long ago morning swarmed his mind. He’d seen no rebels, but he remembered them, imagined them--shadowy figures with guns in early morning mist. They lurked on both sides of the road, deadly sentinels awaiting his return. Crowley put his hand to his forehead--to wipe away the sweat--and then to his eyes--to wipe away the memories. For all his new-found resolve, cascades of fear swirled through his body and insinuated their way into his most inner being. Still, he dug deep into a reservoir of determination few men even know they possess and continued to head for the refugee camp. He dried his palms one by one on his shirt lest the wheel slip in his hands. His stomach twisted on itself and he realized he’d eaten nothing. It was just as well; he fought back a rising urge to retch. He cursed the heat; he cursed the potholes, and he cursed God. Steady, steady, he told himself, but the well of steadiness had gone dry. I’m a wreck, he thought. And indeed he was. He’d done so well earlier on, but now he felt he was coming undone. He had to hold on. Nobody will say I ran, he repeated to himself. I will not give them reason. “Nobody!” he said aloud. Despite all his fear and foreboding he’d seen no signs of the enemy—none. Where were they? Why didn’t they show themselves? When the camp came into his sight, perhaps a quarter mile distant, Crowley stopped. He almost expected to see a column of smoke, but he saw none. He spotted no vehicles; saw no people ahead on the road or near the gate. In the distance the sea of blue plastic shelters and canvas tents looked the same as it had when he left earlier in the day. All seemed eerily serene. Still, he waited. Could he be sure? Caution was the watchword. Perhaps the rebels had already got inside. Perhaps even now they lounged in the director’s office, feet on his desk, smoking his cigars, and sampling his aquavit. No end of lurid imaginings buffeted Crawley’s brain. And so, engine idling, he waited. Finally he let out the clutch and slowly moved toward the gate, only to stop again. Had he seen something, a movement? Once more he waited; again he mulled the possibilities. Panic nibbled and then feasted on his mind. A quick u-turn and he could be safely in the capital in hours. No. He would not run--not again. Once more he engaged the clutch and drove directly to and through the gate. Thankful he encountered no rebels, he was puzzled; he encountered no one at all. The place stood starkly empty. Crowley parked the Range Rover and looked cautiously about. Nothing. A light wind had arisen and tarps rattled and flapped here and there. No one. A dog barked, but no human sound. He went in the door of the administrative building and started down the hall. “Ah, John. You’ve come back.” Dr. Bjornsen’s voice startled him. “Come in, my boy. Come in.” Bjornsen was sitting alone at his desk. “I’m afraid there will be no soldiers. I . . .” Crowley said. Like the outside, the place was silent; save for the whirring of the slow turning ceiling fan. “Where is everyone?” His face creased with fatigue and weary as death itself, Crowley sank into a chair. “Once you left, Mr. Pimsbury was very persuasive. We took a vote and the decision was to leave. I fear mine was the only vote against. So our friends formed a convoy and drove away toward the mountains.” He smiled thinly. Crowley shook his head. Outside in the compound, he heard the sound of engines. Crowley heard voices. And laughter. And the sound of boots in the corridor.